ExpedLife: Exped Dreamwalker to the rescue! Exped Dreamwalker to the rescue! 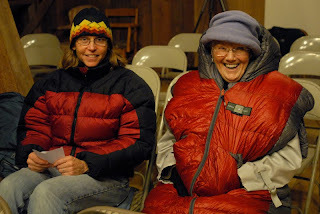 This past weekend the Dreamwalker sleeping bag really showed its true colors when my Mom used it to stay warm at a unique event in Carnation, Washington. Let me explain. Three or four times a year this small town has a gathering of talented people and it's called Soundfalls. It's sort of a live radio show along the lines of A Prairie Home Companion. Live music, comedy, storytelling, poetry. Great stuff. The stage is in an old barn, which is very, very cold in fall and winter. Last winter my mom got cold during the program so this year we made sure she would stay warm without a doubt. There she is wearing a Dreamwalker and sitting on a MultiMat. She ended up getting almost as much attention as the performers! And she was the warmest person in the barn. Another true story from the Dreamwalker Chronicles!